We train employees in green and safe driving skills in September and October every year. These annual practice sessions are led by outside trainers who have been certified as eco-driving instructors and draw about some 100 participants. We also designate November as eco-driving month, and each employee selects one special interest from a list of 10 eco-driving tips for being an eco-driver. In fiscal 2017, we reduced CO2 emissions from corporate business vehicles by 6.1% from the previous year. We encourage the use of low-emission, fuel-efficient vehicles to reduce emissions of nitrogen oxides (NOx), particulate matter (PM) and CO2. As of the end of March 2018, Tokyo Gas has been operating 26 corporate fuel cell vehicles. 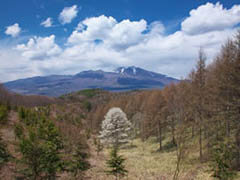 Tokyo Gas owns a 194-hectare forest in the town of Miyotamachi in Kitasaku-gun of Nagano Prefecture and engages in conservation activities to help stop global warming, such as planting and thinning trees under a forestry management plan. We use the forest as an ideal site for providing environmental education to Group personnel. 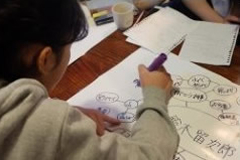 Mori Sato Umi Tsunagu (Connecting Forests, Villages and Ocean) Project is intended to help develop sustainable communities and lifestyles through activities to fight global warming and preserve biodiversity offered in an area in which rivers connect forests, villages and the ocean. In fiscal 2017, Mori (forests) activities consisted of forest-care efforts in partnership with local governments and other organizations. The Sato (village) program engaged local nonprofit organizations in conserving thickets, while the Umi (ocean) program had employees join local teams in restoring eelgrass, which provides shelter for small fish and other marine creatures, in the spring and autumn to help clean up the sea and reduce CO2 emissions. Customers who supported this project joined through their Paccho (Tokyo Gas’s mascot character) point*2 contributions, which are channeled to donations for organizations engaged in social contribution activities involving forests, villages, the ocean and rivers. We hope that broadening these connections will contribute to achieving the SDGs through both business operations and social activities. 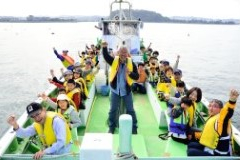 Participants work in the sea in an Umi (ocean) program jointly undertaken with the Amamo (eelgrass) Restoration Collaboration in Kanazawa-Hakkei, Tokyo Bay Area. 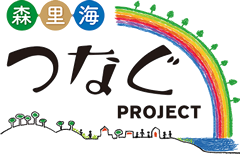 *1 For this project, we set up the Mori Sato Umi Tsunagu (Connecting Forests, Villages and Ocean) Project Committee in cooperation with the Japan Philanthropic Association to discuss and decide which subsidies and contributions are in the public interest and fair. *2 This reward point program is for myTOKYOGAS members and therefore requires prior registration. Members earn Paccho points by using various Tokyo Gas services and participating in campaigns. The points can be exchanged for original goods or points for the loyalty programs of tie-in companies. Tokyo Gas uses the J-Credit Scheme*, which the government operates to certify greenhouse gas emission reductions and contribute to the environment, and participates in internal and external carbon offset programs. 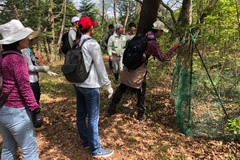 We provided carbon credits equivalent to 1,190 tons of emissions to offset greenhouse gas emissions at the Group of Seven Ise-Shima Summit in May 2016, Japan’s annual nonprofessional Intercity Baseball Tournaments, held from 2016 to 2018, home games of the professional soccer team F.C. Tokyo during the 2017 and 2018 seasons, and our own events. *Under this scheme, the Japanese government certifies credits for greenhouse gas emission reductions and absorption and sinks that are achieved by using energy-saving equipment, forest management and other activities. The credits are used for various purposes, such as carbon offsets and efforts to achieve the goals of business circles’ action plans for a low-carbon society.